La festa della Repubblica is an important Italian national holiday that occurs on the 2nd of June. Unfortunately when national holidays in Italy occur at weekends, they don’t roll over to the following Monday as they do in the UK for example, they simply become absorbed into the weekend. The day, as important to Italy as July the 14th is in France or the 4th of July in the US, commemorates the choice made by the population as to the type of government Italy should have after the end of fascism; monarchy or republic. 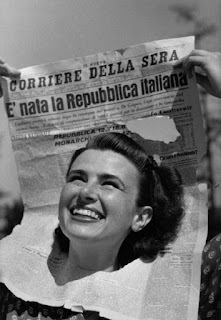 On June 2nd 1946 12.717.923 Italians voted in favor of a republic (with 10.719.284 voting against) and the hostility towards the monarchy, due to their support to Benito Mussolini, increased so much that the Italian monarchs of the House of Savoy were deposed and exiled after reigning for 85 years.